Pumps are the machines that raise water from underground to the required height by the power given to the impellers by motors. Pumps are mainly used by the farmers all around the world for irrigation purposes. It is vital for all of us to understand all the equations that we deal with, in our turbomachinery classes so we can make better pumps and build better future for the farmers and ourselves, of course. Let’s imagine some water at the impeller’s eye in the pump. This water rotates around, along with the impeller blades in a particular angle and direction such that it is moving upwards. This happens because of the pressure difference created in the impellers along the blades. The water at the eye has now transferred to the other side of the blade creating vacuum at the eye which causes more water to be pulled up to the eye. The height from the point where the water is being sucked to the impeller’s eye is called the suction head (hs). The water from here now moves up to the required level as desired by the person using it. It depends on the rated power that the manufacturer says the pump can deliver. Well, this height to which the water is being delivered from the impeller’s eye is called the delivery head (hd). These two heads added together is called the Static Head. i.e hs+hd = hstatic. The height to which the pump can pull water up from the reservoir level (by the tank, we mean the point from where it is being sucked) is the net static head. So, when we design a pump we design it based on the static head it should be providing us with the more the head desired, the more powerful the pump has to be. ‘V2‘ is the velocity at the exit. This is the work that the pump has to do to bring the water up to the desired height considering the losses in the pipelines and the velocity we want at the end. Some losses also take place in the impeller. These losses are not considered in the Manometric head. Where ‘H’ is the specific work done. 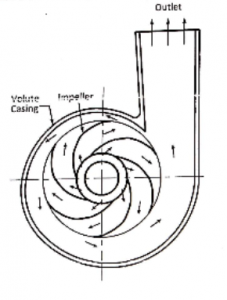 ‘C2‘ is the velocity at the exit of the impeller. ‘U1‘ and ‘U2‘ are the linear velocities of the rotor’s blade at the entry and the exit. ‘C1u‘ and ‘C2u‘ are the tangential components of the absolute velocity at the entry and exit of the impeller respectively. The impeller rotates water imparting kinetic energy to it and also increasing pressure, thus imparting pressure energy. This pressure energy is of great use as the more pressure energy the water has, the better height it can gain. But, the kinetic energy is useless. It would just go waste. So, to make the most use of it, we build volute casing around the pump at the exit of the impeller. This casing is essentially body around pump that gradually increases in the area so that the water’s velocity reduces. And owing to the Conservation of Energy and the Bernoulli’s equation, the reduced kinetic energy gets converted to the pressure energy, which is the useful energy. This useful energy is numerically equal to C22/2g. And hence the equation. The head is not a confusing term anymore. It just means the height to which the water is raised. And this head (h) multiplied by the acceleration due to gravity (g) gives the amount of specific work that has to be done to raise the water. Neha Kalani is currently pursuing her B.Tech degree in Mechanical Engineering from Manipal University, India. Technical Experiences include working on a project based on Graphene applications and has been an intern at the Bhilai Steel Plant, SAIL, India. She is the Financial Coordinator for the Student Entrepreneurship Cell under the Manipal University Technology & Business Incubator and the coordinator for the National level cultural and technical fests.